In 2010, the European Union renewed its commitment to improve road safety by setting a target of reducing road deaths by 50% by 2020, compared to 2010 levels. This target followed an earlier target set in 2001 to halve road deaths by 2010. 2015 was the second consecutive poor year for road safety; 26,300 people lost their lives on EU roads in 2015 compared to 25,970 in 2014, representing an increase of 1%. Out of the 32 countries monitored by the PIN Programme, as many as 22 saw an increase in the number of road deaths between 2014 and 2015 (Fig.1) while progress stagnated in one country. Only 9 countries registered a drop. 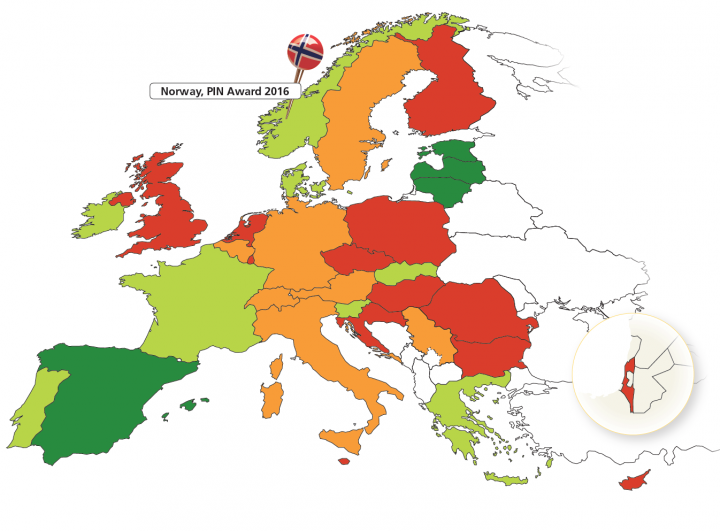 The best reductions were reached in Norway, where the number of road deaths decreased by 20%, followed by Estonia and Ireland with 14% cuts between 2014-2015. Across the EU28, road deaths were cut by 17% between 2010 and 2015 (Fig.2), equivalent to a 3.6% average annual reduction. A 6.7% year-to-year reduction is needed over the 2010-2020 period to reach the target through constant progress in annual percentage terms. Yet the increase in 2015 means that the number of road deaths has to be reduced at a much faster average pace of about 9.7% each year between 2016 and 2020 for the EU to be on track for the target. The political will to improve on this poor progress is important. The lack of it at EU member state level has contributed to a decline in levels of police enforcement, a failure to invest in safer infrastructure and limited action on tackling speed and drink driving in many countries. At the EU level, there has also been a distinct lack of action. Within the last year, the European Commission was expected to bring forward revisions of vehicle safety, pedestrian protection and infrastructure safety rules as well as a new target and measures to reduce serious road injuries. But the proposals on all four initiatives have been delayed and it is not clear when they will see the light of day. Measures that can reduce the number of road deaths quickly are known and urgently needed at both national and EU levels. There were 20,580 fewer road deaths in the EU in 2011-2015 than there would have been if the number of road deaths had remained constant after 2010. According to ETSC estimates, this reduction is valued at 40.6 billion euro (Fig.4). Preventing road deaths and serious injuries by road safety measures on the EU roads is a sound investment. The European Commission has, for the first time, published an estimate of the number of people seriously injured on Europe’s roads – 135,000 in 2014. This follows the adoption, by all EU member states, of a common definition of what constitutes a serious road injury, i.e. an in-patient with an injury level of MAIS 3+ on this international classification scale. ETSC recommends that the European Commission adopts a target of a 35% reduction between 2014 and 2020 in the number of people seriously injured according to the MAIS3+ definition. A 35% reduction over the period 2014-2020 would be similarly ambitious and numerically comparable for Member States to the target to halve road deaths between 2010 and 2020 (see Part II). In addition, the EU should adopt a joint strategy on serious injury including measures against which delivery can be made accountable.